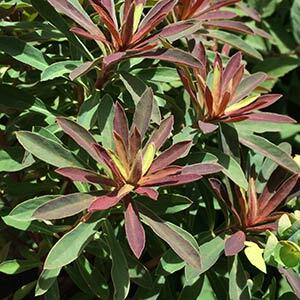 With its distinctive variegated foliage Euphorbia x martini ‘Ascot Rainbow’ is a hardy euphorbia with foliage that is green, yellow and also red. This is a widely grown cultivar, used by landscapers for the foliage that changes with the seasons. The red is more evident during colder months. A wonderful upright habit, cream flowers in summer and its heat and drought tolerant as well. Reaching a height of around 25 cm with a similar spread, Euphorbia x martini ‘Ascot Rainbow’ prefers a warm sunny position in a well drained soil is best. Also well suited to growing in containers or in the rock garden. Drainage is the key to successful growth, a general all purpose fertiliser applied in spring is all that is required. Potted specimens will need to be repotted every 3 – 4 years as the potting soil becomes depleted. Pruning is best carried out after the danger of frosts is over, so early spring in such areas. Remember to wear gloves as the sap of the plant is an irritant. Best pruned lightly each year to maintain a compact growth habit, pruning will also encourage better flowering. You can also prune away spent flowers heads as a tidy up if required. Any old dead wood can removed as needed. You can also hard prune old flowering stem back to the ground to reinvigorate the plant. Planted next to a pathway Euphorbia x martini ‘Ascot Rainbow’ can make a great border plant, in a container as a feature or in the border. Very useful in ‘low care’ situations due to its drought tolerant nature. Also coping with cold winters and even frosts this is almost a ‘bullet proof’ plant, well suited to mass planting. Euphorbia x martini ‘Ascot Rainbow’ Summary information. Height – Reaches around 50 cm in height. Spread – Will spread to form a bush around 50 cm across.